There, it's said...in black and white...out there for others to know my shame. As you all know by now I am a list girl- and top of that list for the past umpteenth years has been DECLUTTER AND TIDY MY DESK. 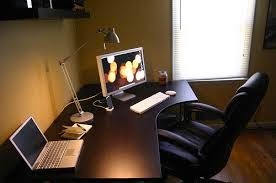 Actually my desk could NEVER look anything like that- it's just not in my personality to be so minimal. 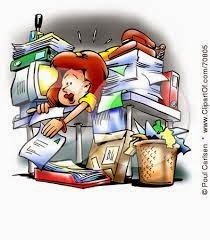 But I aim to have at least a part of my desk visible under the piles of accumulated crap...er I mean stuff....no I mean 'important' papers. I do clean up my desk area...occasionally. When the guilt becomes so thick that it strangles me...or when I can't find the computer. And it looks nice, for a day...two at the max...then somehow these tiny gremlins come out at night and ....heh presto...back to chaos. I will say now that this----points to picture above- is NOT my desk. However I feel that this is where it could head if things aren't dealt with. Not that everything on my desk isn't vitally important. There is my lists of books I want/ intend to read---need those. recipes I've torn out of magazines (the garlic prawn and tomato risotto the other night was delish)- and other, I'm sure necessary, bits and pieces. Then there is the nightmare pile to the left of that- which to save us all I refuse to show in detail...or actually at all. Now what I need is a way to get this organised, sorted, under some form of control. My goal in writing this is that I feel forced / pressured encouraged to work on this area of productivity. Because in reality I am not being productive at all- there has been other issues demanding my time but really forcing a path to my computer before I settle down to write is not good for myself or my work. 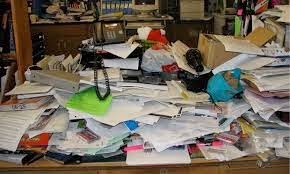 Isn't there a saying about a tidy desk, tidy mind. In that case.... this could be me in a few weeks time! So wish me well on my mission...I shall, over the next week, attempt another clean up. (can't rush these things). And I will work on finding a way to keep it all under some form of control. Any ideas and suggestions will be greatly appreciated.